The official awards ceremony was held last week and while we were attending we’re sorry to say that unfortunately we don’t have any photos. 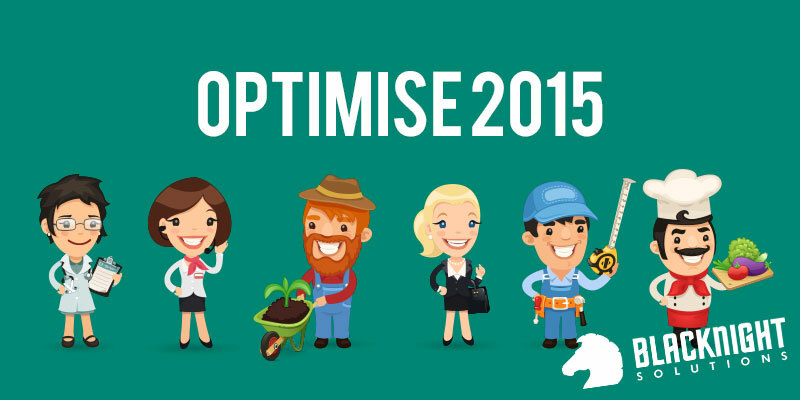 However OPTIMISE 2015 was announced and launched by the Minister for Communications, Alex White, T.D. If you don’t know what OPTIMISE is it’s a programme for SME and micro-business owners to get professional help with their website and their online presence. The big difference with this years OPTIMISE programme is you no longer need to already have a web presence to apply. You’ll be able to apply from the 2nd of March this year. So get thinking about it and we’ll keep you updated. IEDR calls on SMEs to apply for 2015 OPTIMISE programme launched by Minister for Communications, Alex White, T.D. Monday, 26th January 2015. The IE Domain Registry (IEDR), the managed registry for Ireland’s official Internet address .ie, today announced that its OPTIMISE e-Commerce Website Development programme will help a further 15 small firms to improve their e-commerce capabilities in 2015. Calling on Irish SMEs to apply, IEDR has opened the OPTIMISE programme for the first time to applications from small businesses operating entirelywww.google.com offline, i.e. without a web presence. The announcement was made at a ceremony addressed by the Minister for Communications, Energy and Natural Resources, Alex White T.D. who presented graduation certificates to last year’s OPTIMISE winners. Now in its fifth year, IEDR’S OPTIMISE programme has already provided 60 SME and micro-business owners with consultation, training and e-commerce development support, including tailored e-tools and features, to “optimise” their existing online presence and grow their business via the Internet. Research1 shows that thousands of Irish small businesses still remain offline. Their absence from the Internet means that they are missing out on a share of the €6 billion spent online by Irish consumers annually, over 60% of which goes to businesses abroad2. IEDR believes that its model of working shoulder-to-shoulder with business owners and service providers through a dedicated programme such as OPTIMISE addresses the issue more effectively than merely cheerleading from the side-lines. IEDR hopes that its decision to also support small firms with no online presence will give at least some of those businesses the training, tools and knowledge to embrace online channels and technologies as viable routes to their customers and markets – and as a pathway to sustainable business growth. Speaking at the event, Minister for Communications, Energy and Natural Resources, Alex White, T.D., said: “Our return to economic growth, renewed consumer confidence, and the extra money – albeit modest – that is now finding its way into people’s pay packets all provide opportunities for Irish business. The growth rate of the digital part of the economy is about 20% each year. That’s why the Statement of Government Priorities put an emphasis on the digital economy, because it has huge potential to help sustain and accelerate the recovery in jobs and incomes that is now underway. The Government is taking action to significantly increase the number of companies trading online, and to increase the share of online retail spend that goes to Irish businesses. Last year my Department launched a national Trading Online Voucher Scheme. The scheme is an initiative under the Government’s National Digital Strategy and is included in the Action Plan for Jobs. Working in partnership with Enterprise Ireland and the Local Enterprise Office network, the Scheme aims to get 2,000 small businesses trading online by the end of this year. Congratulating the small businesses who completed IEDR’S 2014 OPTIMISE programme, Mr. David Curtin, Chief Executive of the IE Domain Registry, said: “IEDR is proud to have helped 60 small firms to embrace e-commerce and find their niche online. Now in its fifth year, OPTIMISE is evolving too and we are excited to extend our support to offline businesses for the first time. I’d strongly encourage SMEs to take a leap of faith, apply for a place and let IEDR help them to realise their online potential this year. OPTIMISE is about identifying the right tools and technologies for each applicant and instilling the confidence and know-how to help small business owners take their company forward online. We understand that there are often time, resource and knowledge gaps for SMEs when it comes to e-commerce and OPTIMISE seeks to fill those gaps with practical support, development and training for the small business owner. The application process for IEDR’s 2015 OPTIMISE Fund will start on 2nd March 2015. For more information please visit www.iedr.ie/optimise or follow @IEDR_dot_ie on Twitter for updates.